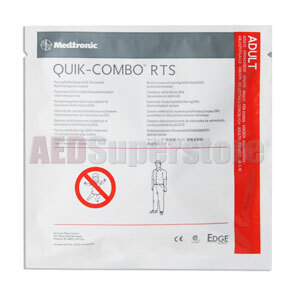 RTS (Radiotransparent) EDGE System Electrodes with QUIK-COMBO Connector for LIFEPAK Defibrillators by Physio-Control. Unique Edge System(TM) technology results in even current distribution, helps reduce risk of skin burns. Perform ECG monitoring, noninvasive pacing, defibrillation, and synchronized cardioversion through one set of electrodes. Disposable QUIK-COMBO electrodes designed for a single patient application. Lead wire is 2 feet (0.6 m) long. Must be used with the QUIK-COMBO therapy cable designed for your device. Please note: These electrodes have the lead wires inside the foil packaging and are unable to be "pre-connected" to the AED during storage. Radiotransparent pads are completely transparent under typical adult x-ray levels.